Monocots, or monocotyledons, are a class of the flowering plants, or angiosperms. Monocots are named for and recognized by the single cotyledon , or seed leaf, within the seed. The first green blade emerging from the seed upon germination is the cotyledon, which contains sugars and other nutrients for growth until the leaf is able to photosynthesize. Monocots comprise about 67,000 species, or one-quarter of all flowering plants. They include not only the very large grass family (Poaceae, 9,000 species), but also the orchid family (Orchidaceae, 20,000 species), and the sedge family (Cyperaceae, 5,000 species), as well as palms, lilies, bromeliads (including pineapple), and the Araceae, which includes skunk cabbage and philodendron. The angiosperms have traditionally been divided into monocots and dicots alone, but recent work has shown that while monocots form a natural evolutionary group, dicots do not, and so the angiosperms are now grouped into monocots, eudicots , and basal angiosperms. In addition to the single cotyledon in the seed, monocots can be recognized by the arrangement of vascular tissue in the stem. Vascular tissue includes xylem , used for water transport from the roots, and phloem , which carries sugars and other nutrients from the leaves to other tissues throughout the plant. Unlike other angiosperms, whose vascular tissue is arranged in rings around the periphery, the vascular bundles of monocots are scattered throughout the stem. One consequence of this is that monocots cannot form annual rings of hardened tissue—wood—and so are limited in the strength of their stems. Nonetheless, some monocots, notably the palms, do attain significant height. Leaves of monocots have parallel veins, as seen in grass. The roots of monocots also differ from other flowering plants. In monocots, the first root to emerge from the seed dies off, and so no strong, central tap root forms. Instead, monocots sprout roots from shoot tissue near the base, called adventitious roots. The familiar fibrous root system of grasses is an example of this rooting pattern. Many monocots form bulbs, such as onion, gladiolus, and tulips. These are not root structures, but rather modified stems, made of compact leaves. This can be easily seen in the layers of the onion. Most monocot flowers have flower parts in sets of three, so that there may be three or six petals, for instance, along with three egg-bearing carpels and pollen-bearing stamens in some multiple of three. The pollen grains of monocots have a single slit, or aperture, which splits open to allow the pollen tube to grow during fertilization . In contrast, the pollen grain of eudicots has three apertures. 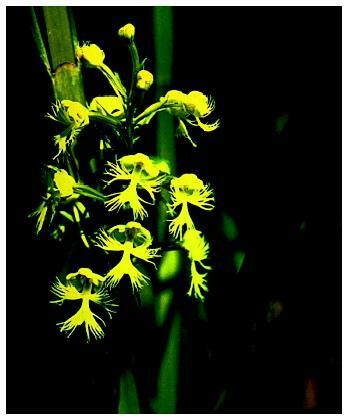 An Eastern prairie fringed orchid ( Plantanthera leucophaea ), a type of monocot. bee species that pollinates them, luring the male in to attempt copulation. During this process, the pollen, all of which is retained in a single, sticky mass, is transferred to the male bee, who will carry it to the next flower in another fruitless attempt to find a mate. In contrast to the showy orchids, grass flowers are rather simple and dull, in keeping with the absence of any need to attract insects. Grass flowers are suspended at the tip of the plant, where wind can carry the pollen away to land on the female flower of a neighboring plant. Three grasses—corn, wheat, and rice—provide the vast majority of calories consumed by humans throughout the world. Their seeds, called grain, are rich in carbohydrates and contain some protein and vitamins as well.